The Cadillac Allante was a major production that was sold from 1987 to 1993. By the end of 1993 Cadillac had sold nearly 21,000 models. The models have seen a shift in design, engine power and technological advances over the years. The 1987 model, for instance, featured an aluminum top. The 1989 vehicle received a new 4.5L V8 engine. In 1990 the roadster featured a cloth convertible roof with an optional hardtop at an extra price. Throughout the years the models were revised with subtle changes in design. In 1993 they release the most powerful version. 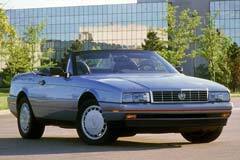 The 1993 used Cadillac Allante was the only roadster with a Northstar 4.6 L V8 4 - speed automatic engine. This model came with a one-of-a-kind traction control system and a road-detecting suspension. It has 16 inch rims and a top speed of 155 mph. The car also has dual cup-holders, modified alloy wheels and revised snug seats. 1990 Cadillac Allante 1990 Cadillac Allante Collectible Pininfarina- only 2523 produced- NO RESERVE!